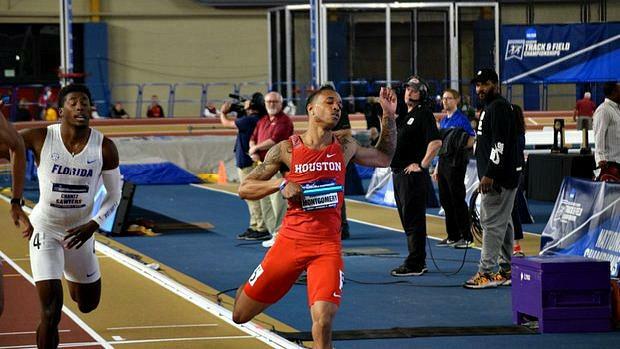 University of Houston superstar Kahmari Montgomery got his start as a youth with the famed Aurora Flyers Track Club and later Plainfield Central High School. After sending all five of the program's qualifying entries on to the finals, the Houston men picked up 36 points in the sprints as Amere Lattin (60-meter hurdles), Kahmari Montgomery (400-meter dash), Obi Igbokwe (200- & 400-meter dash) and Mario Burke (60-meter dash) all earned All-America honors with top eight finishes while the quartet of Lattin, Igbokwe, Jermaine Holt and Montgomery claimed Houston's first 4x400-meter relay national title in a time of 3:05.04. Ranked the No. 1 team in the nation with a world-record time earlier in the year, the Houston men's 4x400-meter relay lived up to its ranking Saturday night as Montgomery came from behind on the final leg to give Houston its first national title in the event in program history. Houston was the only program to qualify multiple athletes for the final of the men's 400-meter dash as Montgomery and Igbokwe picked up a combined 12 points in the team race with Montgomery clocking a PR and Houston record, 45.03, the sixth-fastest 400 time in NCAA Championships history. Igbokwe finished fifth overall after winning the finals' first heat with a time of 46.04.